After a month taking AG factor, my skin more radiant, glowing n i feel younger than my current age. Ive been using praventac and Agfactor for a month now and result is amazing..i will continue using these products.love it! Great product. It hydrates my skin. Best decision by far, the result is incredible! I have been experiencing hormonal acne since mid-2017. Since then I have been trying all kind of methods and remedies to help but none seemed to be as effective as Praventac and Ag-Factor! I came across an ad of the product in May 2018 but was doubtful however I decided to give it a go. 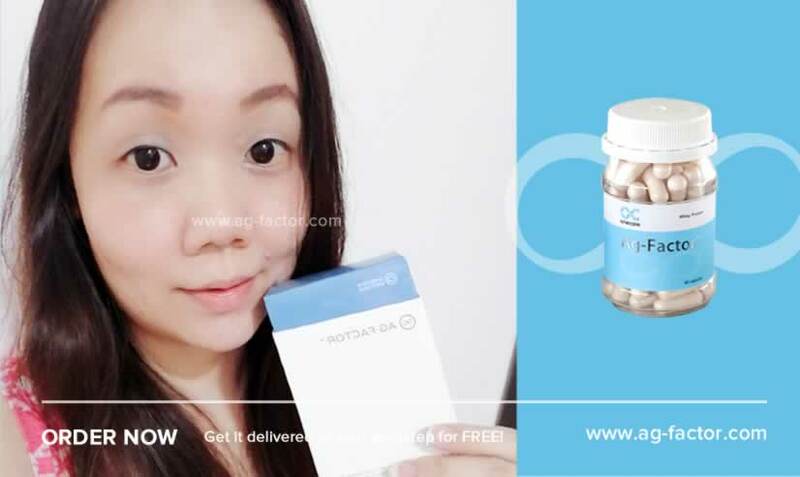 I’ve been taking Praventac and Ag-Factor together for nearly 2 months now, with both intake it has definitely improve my skin condition in a short period of time. Redness and acne growth has reduced drastically but scars are still visible. I am going to continue the products for a few more months to achieve better results. This product really works.I have been using it for only a month and there's really a big difference. I recommend it to everyone. It is without a doubt that I tried a variety of skin products that will work on my skin since I was diagnosed with a sensitive skin prone to acne and the likes. 9 years ago, my skin was not entirely irritated so I had only few breakouts and it was almost treatable. However, as I entered my 30s I was oblivious to what was happening to my skin that I certainly begun to have acnes around my face which predominantly appears during my menstrual period. To make matters worse, they don't dissipate easily be despite the many thanks facial products that I have used. Eventually it made my skin dull, scarred, with red marks and uneven skin tone. I felt hopeless and frustrated but it was also at this point that i discovered the power of ag factor as endorsed by onecare wellness that gave an edge to my skin. It was doubtful at first but after a week of using it, the result was immensely profounf. My skin became lighter, scars started fading away and even my pimples despite trying to popout were gradually disappearing. The best part is I felt as if it has regulated my menstrual hormones. I am continuously using this product and I dare say that I felt more confident and perfectly satisfied with the results it's giving me. I am an ag factor women and I'm loving this product. Thank you one care wellness for introducing such a wonderful product. omg! Ag-Factor has a fast/quick result. Younger looking! i love it! 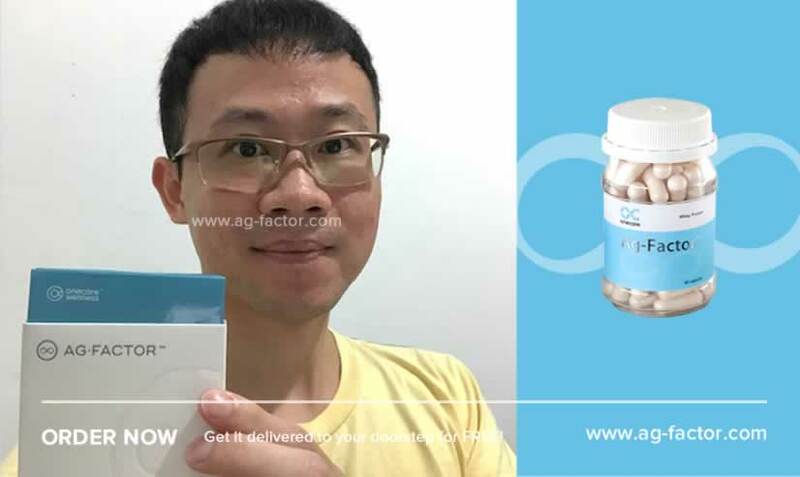 Ag-factor works as after taking it for 3 weeks I noticed my skin to be more tauted. Also I have to use lesser number of skin care regimes as I wanted to cut cost on it. I will ordering my bottles for another 3 months to see the complete benefit. Ag factor gave my skin awesome results, my complexion has got better. I feel that i have got even skin tone after its usage. I bought Ag Factor for my wife and this is the sixth bottle she consume. Here's what she told me: "This is my sixth bottle and I'm obsessed with it. My cracked feet was healed completely before my 1st bottle finished and my skin is getting more radiant and fairer. I've tried so many products and none of them work quite as well as this one did." I'm so happy that this work so miraclly well on her and her skin. We'll continue to support Ag-Factor. I have consume 1 bottle of AG Factor so far & will order 2nd bottle soon.After nearly 4 weeks my skin feels smooth,pigmentation seems to lightened up and feels energetic all day..of course I will definately continue with AG Factor as my beauty enhancer.. I'm 40 years old! After just a month of taking Ag-Factor, I felt that the skin on my face and body became smoother and brighter. I feel so much younger. I will definitely re-order. It’s worth it! I started noticing result half way thru my second bottle. My hair feels thicker, my face looks brighter and my body feel smooth even without moisturizer! I'm using Cera-5 and Ag-factor together and I believe the result will be even better after my 3rd bottle! I noticed my skin more hydrate after 3 days of consuming Ag- Factor. In a week, my skin texture become smoother and brighter. Sometimes i not even apply moisturizer in my air conditioned room. After 1 month, i LOVE to see my glowing & even- toned face and lot of my friends notice my skin look better. I am highly recommended Ag- Factor to all of my friends and to all of you. I like this product.sure will repeat order. I just tried for a month now. It works well with my hair and skin. Reordered another set for 2 months use. I love Ag=factor. My skin is fairer, glowing and smoother after taking Ag=factor. It makes me look younger. Thank you onecare wellness. I like the way it eliminates wastes from my body. The fact that it cleanses my liver is a great point to have this product on hand. praventac and ag factor surely helped with my acne issue. It took me 3 weeks to notice the difference. Im nearly into my 4 weeks and Im about to order for my 2nd month of dose. No side effects whatsoever. I've been using the Praventec and Ag Factor to treat my pimples and fair shin for a month now and it works well to my skin. I just have few breakouts my skin became less oily. I will be placing my next order soon. Bought 2 bottles of Praventac and agfactor. Tried for 2 weeks and i would say no side effects. I would need 2-3 more weeks for a better review on effects and results. After using for almost a month, I can feel that my skin not that dry and feel more energetic. I'm going to continue with the product. Ag factor awesomeeee!!! A superb product I've tried. I'm finish my 1st bottle and notice that my skin has a lot of improvement than before consume ag factor. I had used this product and it does improved the texture of my sensitive complexion. improvement noted in term of skin texture and also old scars after a month using it. I like the results of the combination of ag-factor and praventac. The flexibility of getting the package and of course the results. I did took pictures of my face one month before the treatment. And I tried one month of this combination and it did what it was told. My face acne scars got lighten so much and pimples had stop popping out as I used to have new pimples popping out almost every single day. I will continue this product for another couple of months as their result speaks it all. I used AG Factor for 4 weeks with Preventac. I still have pimples but my friends noticed my glowing bright skin all over my body, even my face which normally bit dark because it's oily. Maybe if i'll continue it for more months my pimples will be gone too. Wish I still can continue it. Please make it affordable. I'm using ag factor and praventac for almost 3 weeks now. The first 2 weeks there is a slow progress and I had some breakouts, I trust the product and continue using it. At 3 weeks now, my skin is brighter and clear though some minor pimple marks and some small pimples compared to my cystic acne before. My overall skin became brighter not just the face. Overall it was a good product. I take ag-factor almost 1 month. My skin has improved a lot. Noticed that my pimples and scars getting lighter and smoother. I look much more fairer to my face I was happy with the result and definitely i'm going to re-purchase again! thank you so much Ag Factor !!! ...muah3.. It has only been a month since I used this combo. Praventac+Ag Factor. And I could see so much of improvement. I don't have pimples anymore and my skin is much clearer now. Will definitely continue this combo. Thank you one care. Aku baru aja pakai Ag-factor..Sebotol belum habis..Tapi udah terasa hasilnya. Kulit terasa lebih lembut dan kencang...Semoga sampai 3 botol bisa mendapatkan hasil yang sempurna. Semangat! I am only on my first month supply but it seems like acnes stop popping up. There are still dark spots but I will continue to order my second month supply. I will post results next month. But so far very happy with results I got. Hi, I am an Indian working in Saudi Arabia. I have been suffering from acne and its scars since I was studying in my 10th grade. In between it was getting better. Now I am 28 and from last one year, it went to worst from bad. I have lost all my confidence and it was very difficult for me to face people. I have consulted many dermatologists across India and Saudi and had a lot of medicines including Homeopathic. I was not able to see any specific changes in my face and day by day the pimples keep on coming and after 2 or 3 days there will be a huge black spot which will remain there for weeks and even months. But one day I came to know about Praventac through facebook. At first, I was not so sure about this product. I saw the testimonials from satisfied customers and searched a lot. Considering it as an another option, I decided to buy it, then I read that the results would be great if I consume both Praventac and Ag Factor together. By reading all the testimonials, one thing was sure that, the results will be very very slow depending on individuals. At first, I bought Praventac 2 month supply and Ag factor 2 month supply. If you are ordering from outside Malaysia, you have to pay from a credit card. The delivery was fine. After order confirmation, it took 4 days to deliver from Malaysia to Saudi. Thanks DHL. So, as on today, I have finished my 2 month course of both Praventac and Agfactor. I must say that, this product can do wonders as it has got no side effects and very minimum outbreaks if taken together. The results will be very slow but positive. I can clearly see the difference in my face. Now, I got another 2 month supply today. I will be uploading the pics later. So, anyone around the world suffering from severe acne and scars can blindly go for this product. Even though, you are promoting these products very well through facebook, I would suggest Praventac team to introduce this products into countries like India, where a lot of people will be eager to try this and please give more user friendly payment option for international customers. Even though its expensive, its a real genuine solution for acne and scars. I suggest everone to take both Praventac and Ag Factor together to get the best possible results. First, go for a 2 month supply. It would take a minimum of one month to see a minor change in your face. But, gradually you can see wonders. I am so happy and I am gaining some of my lost confidence. My salute to the OneCare Wellness team!!! hi..I have been using Ag factor and preventec for 1 month. I noticed that my skin looks glowing and had less hair fall. my sleeping routine is getting better and sleep tight. For sure I will continue to consume AG factor and preventec as I was very satisfied with this product. can't wait for the next change!! I am just about to finish my 1st bottle and I can already see the big difference.It make my skin brighter and firmer and I'm loving it! In fact I just ordered my 2nd bottle.Thank u Ag-Factor for making me more confident and beautiful! I have been taken Ag-Factor for a month now and I noticed extreme different in my hair fall problems. I do still have hair falls but it is obviously lessen. My skin also looks brighter and feel smoother. I will definitely continue taking Ag-Factor. I have been taking praventac & agfactor for 2mths. Praventec really improved in my pimples breakout in jus 2 weeks which is why i am still taking it. I am now trying the cera5 & looking forward to the good results too. Thanks praventec & agfactor for resolving my pimples issues that has been troubling me for almost 6mths.. will continue to take till my skin is back to normal. Will give the review on cera5 once i try it later. Hello Ag-Factor , i have been consuming Ag factor for 4 weeks...i have a fair skin but after taking this product, my pimples were came out but now i noticed that my pimples and scars getting lighter & disappeared. My skin has improved alot and my face less oily too. I was happy with the result. Many thanx to Ag Factor ! I have been consuming ag factor for a month and there is just a slight improvement but I've ordered the 2nd bottle as I haven't given you up ag factor! The thing I loved about AG factor is making my skin softer, reduced my fine lines, my skin looks lighter and younger than before. Thanks Ag factor! I have been using AG factor for a month and it gives me already a satisfying result. Thank you for providing and giving us an excellent service, Good job.. more power! Hi AG Factor, Ive been using Ag Factor for almost 3 weeks now. Ive noticed my skin tone is evenly lighter than before. Ive been using other supplements years before but AG factor seems effectively fast result, affordable and safe. As a mother of two, who has dark eye circles and sleepless nights, i think its the best supplement for me, and i highly recommend it to everyone. Thanks AG Factor. Just started to use this product approximately three weeks but I am glad that I made the right decision to try this product. I didn't have as problematic skin before, however recent months or close to a year I have been having breakouts due to stress and hormonal change. All those scar marks were big and dark, and still had some acne and wounds then. It really made me worried, it looked unpleasant like never before and I have to pile up on the makeup and concealer, also worried would the scars ever go away. Then I came across this product – Praventac, what intrigued me was it says it will be effective even for old scar, so I wanted to give it a try. On purchasing, the advice was it would work better pairing with Ag-Factor, since I have also come across and heard about Ag-Factor and I have wanted to try it before as well, so why not – I gave both products a go at the same time. After nearly a month of taking these, I now can see that the acne scars look smaller and lighter, got improvement, and I think even the injury scar on my knee I can see improvement, that was a bonus surprise. I would say all the scars are not totally gone yet of course but because people often say you have to give any treatment a 2- to 3-month time to see the ultimate result right? I would want to purchase my second bottle of Praventac and Ag-Factor soon! I'm impressed with Ag-Factor as I have just consumed for 1 month. I can see the improvement on my skin and I'll continue with Ag-Factor. Thank You Ag-Factor!! I JUST STARTED USE 1ST BOTTLE ..CAN SEE THE DIFFERENT IN 1MTH... 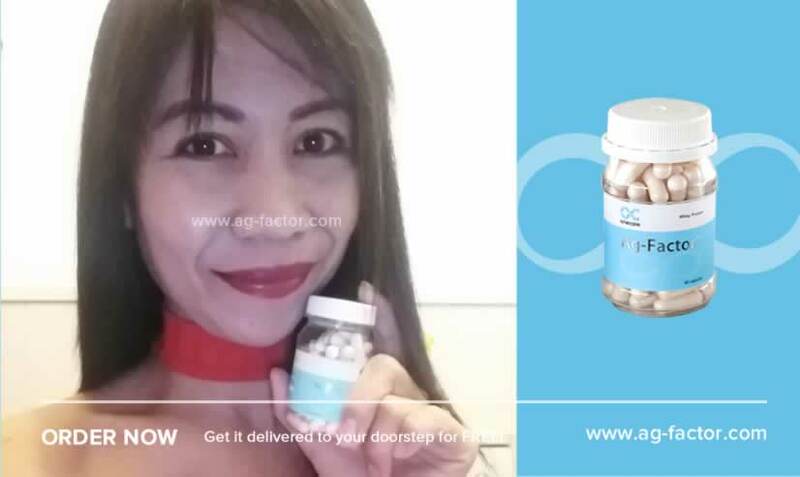 I WANT TO REPEAT THE ORDER..
Hi since I'm fully satisfied to your product I' am planning to order 3 bottles of ag factor .. I' am truly happy to the result with in one month of using it . I start using this product 1 month ago, my skin condition is improved. My skin is less acne during my menstrual cycle and my skin tone is look better. TQ Ag-factor , I love this product !!! I just finished today my 1 month supply of praventac and ag-factor , I did notice that my face became less oily even applying a liquid foundation but I'm not sure if it helped to lessen my acne problem and scars. I am planning to order a second one as it recommend to use at least 3-4 months. I do understand that each and every individuals are different and have a different reactions but since reading a lot of good reviews I am hoping to see the results soon. I will post my before and after photos and u can do the judgement. I used other supplements as well , like vit. C and zinc. I am surprise though that other can see the results within a week of used only? I'm new in using this product , almost one month so far so good and may face blemishes is become light and my skin color because I'm fair , it become rosy and more clear .. Thank u Ag-factor such a great help .. I've been using Praventac & Ag- Factor for almost 1 month.I have oily face and when i applied pimple cream at night, the next morning my face will become oily but after eating praventac & Ag-factor, my face became less oily. Hopefully after buying the 2nd batch, my pimple will become lesser. My skin looks healthier and more radiant. I've used a lot of other products but this is the most effective. Tq, Ag-Factor. I'm on my second bottle now. My skin is radiant and glowing... And it helps to flush out toxins in my body. My porehead wringkles has dissapear on the 2nd week. Amazing! After I consumed one bottle of Ag-Factor, the first changes that I noticed was skin became more cleaner and smoother. This product I consumed for 1 month period, it was improving my quality of sleep! Will going to continue for longer period to get my desire effects! Hi people. I have been using this product and the results is very very good. Within a month of consuming Ag-Factor, my skin’s condition has changed tremendously compared to before. My skin is now smoother, more suppled and looked healthier. I have dry skin but since taking Ag-Factor everything has changed. Thank you Ag-Factor !! After using one month of ag factor, the breakouts is getting lesser. Acnes pigments getting brighter and my skin getting less sensitive. Thanks ag factor for curing my long term problem. Previously i had been using a lot of other anti acne products but it doesnt really cure the roots. Breakouts happens almost everyday. Hi people. I have been using this product and the results is very very good. I can only advice anyone who wants a fabulous skin to try this product and you will see that it really does work. It has made my skin look younger, smoother and also fairer. Don't waste your time on any other products out there, the solution is already here and has been proven effectiveness. thanks AG-factor. Hasil sangat luar biasa dalam 2 minggu ,waktu yang singkat ,padahal ini baru pertama kali, kulit jadi lebih halus ,lebih cerah ,rambut tidak rontok lg ,flek diwajah memudar , wajah terlihat segar setiap bangun pagi,tanpa make up siapa takut. Saya akan beli lagi. bye bye wajah kusam .... Bye bye dark spot... Thank u AG Factor . 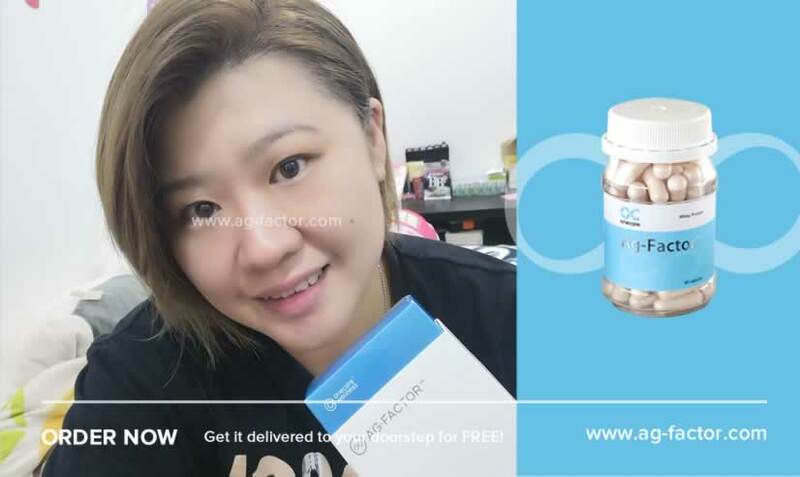 i have consumed ag factor for about 2 months..and i found that my skin looks better and creamy..and i have no more hair loss..my hair looks healty and shining... but my question is..can ag factor reduce eye bags and wrinkles ? 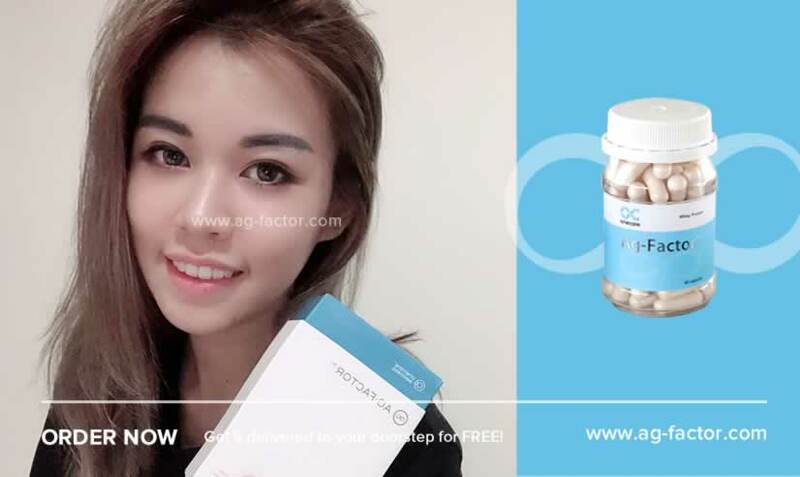 After taking Ag factor for 3 months, I found that my skin become fairer and smoother than before. It also helps in lighten my pimples scars. Will continue taking Ag factor for a better result in future. Hi AG Factor, when I came across your product I was extremely skeptical having tried many products before with little positive results. However after only 2 weeks I find that my pigmentation and age spots have reduced visibly. Now after completing a whole month supply with more happy result I simply can't wait to continue taking AG Factor. Btw I also realized I experienced deep restful night sleep. Thank you Ag-Factor for your good product. I can feel the difference after three months of using your product.I get some compliment of fairer and smooth skin from friends.I will recommend your product to my friend. entering 3rd weeks of using ag factor, I notice the colour of skin is getting more balance. Heath condition is also improving. My husband noticed my skin tone is much better. Plan for 2nd purchase for 3 months consumption. it has been a month i'm consuming Ag-Factor, my skin getting smoother and fairer. Looking forward to experience more in 3 months time. I'll stop taking snow white injection after this. This is affordable price with good result. Thank you Ag- Factor. Every month on my period I always got acne around my face. and the acne scars that bother me, before the old one is completely disappear, new acne will appear on my next period. but using this product, agfactor, I never face the same problem anymore. acne is controlled, and no scars remain on my face. thank you^^ give a everyday happy face without acne. Make me confidence and proud to be me!! Love the agfactor! My skin is glowing and my acne scars slightly lighten. Next I noticed, my sleeping routine is getting better always sleep on time and sleep tight. Every morning I will never failed going to the toilet as I knew it cleansed toxin,the blood in our body and liver. Very healthy supplement! And now I left with few capsules. Need to stock up now! After this, it will be my second bottle to order,can't wait for the next change!! Thank you Agfactor!! I have taken my first bottle with Ag-Factor. I can see some changes to my complexion and can't wait to see more improvement in months to come. Will order some more of Ag-Factor, a natural supplement with no side effect. I've been taking this product since Feb 2014,now I'm ordering my nos:15&16 bottles.I never use compact powder except lipstick,my friends disbelief me.I'm 62yrs old. I am very pleased with this product. I have been battling skin problem for a long time. I was like 'Wow' ! I see alot of improvement within a month.I am so happy that I found this product at the right time. I almost finish 1 bottle of AG factor and my skin looks more radiant and my pigmentation more lighten...will continue using this product. TQ AG FACTOR.. I have been taking ag factor for 3 weeks and have to say that it really brightens my skin and give it a nice glow. Will continue for maintenance. My problem just a panda eye and visible open pores, so why not if I try this product for a month.... before finishing pop in all the pills I could see the different - the discoloration faded and pores shrinking, but what amaze me is that wrinkles are not noticeable at this age of mine in mid 50s...... come on ladies preventive measure is the best action before its too late. After taking AG FACTOR in 2 days time I can feel the softness and creamy in my skin and now almost 1 month taking ag factor i get compliment from my daughter that my skin is glowing thanks ag factor, hoping for better result for the next bottle! Luv it...been using it for 3 months and I can see the difference. Will be using it as it suit me. Glad that I know about it. Been taking praventac and AG together for one month. Blemishes have reduced, so have certain scarrings. Scarring on other parts of body, besides the face, are visibly faded. Purchasing another months' wortg, hoping it will heal more of my scars. I see a lot of improvement to my skin though i only started taking AG Factor & Praventac for 1 month. Definitely i will still continue taking them. I have been using ag factor for 1 month now and my skin become better.i will keep using it. After a month of consuming Ag-factor, I can feel my skin is now more firm and elastic. Will continue to consume to see if I can see more result on the balance of 8 benefits Ag-factors claimed it can improves our skin. Try one bottle, one of my friend said i look brighter. Its been almost 1 month I using this product and I can feel and see the difference after 2 weeks of consuming. My skin is smoother and my dull complexion are gone now! Love this product and I wish to continue to take it and hope to see more incredible result after 2nd bottle. My husband recommend this product to me actually, At 1st i was half minded whether it would work out on me or not. As i tried so many cosmetic products from higher to lower category still never find solution for my skin problem (pigmentation n scars on my face). After 3 weeks take Ag-Factor, i started to see allot of differences, my skin become smoother, scars started to disappear, and pigmentation stopped. now i m in my 2nd bottled, very happy and satisfied with the results. Even my husband noticed allot of changes in my skin. Outer Beauty attracts, but inner beauty captivates. i will continue consume the products, Thanks allot Ag-Factor and also the customer service staff who was very humble replying all my inquiries . My skin became radiant and smooth... Been using for a month now... Love the result... Thanks AG-FACTOR!!!! I'm first at this product but my face became more supple and brighter thank you ag-factor I will continue to use this product it really works! hi, thanks ag-factor, my skin really looks different, my acne disappeared and my skin more smooth and white. really satisfying. Ya I realized ag factor really works! That my skin felt soft and supple. Thank you ag factor!! Hi, I’ve been using AG-Factor for almost 1 month. After taking this product, my skin become more smooth and my sensitive skin also reduced. Thanks AG-Factor. i'm new to this product.. it's only been a month.. i dont see big result yet.. but what i can see is the pimples keep reducing and it feels good.. i will continue taking it for bigger result..! this is awesome~! It's been 16 days of consuming Ag-Factor.. Yesterday, my friend noticed the improvement of my skin tremendously. Before this, I didn't use any facial product, just rinse with water because being a working mother of 3, i'm too tired for that and it makes my skin darker, super dry and full of pigmentation. Does it make my skin soft, smooth and radiant, reducing pigmentation and freckles, reducing fine lines and wrinkles? YES! I'm fair so no comment on that. I'm satisfied with this product and highly recommended for those who seldom like to use skin care product like me but however, I am still going to get hydration skincare product range and a sunblock to get the optimum result. Cheers. i bought preventac+ag-factor.its been 4 weeks now.i notice that my skin become smooth and lighter.i can't say that the scar is been cleared up. i know how long a process can be.now i'm waiting for my next order to deliver. i will continue consume it till my scar is gone. thanks preventac/ag-factor. Hey there.. I'm having Praventac and Ag-Factor close to a month now. I didn't expect much from this product as I've been trying quite a lot of other brands for the past year. But Praventac and Ag-Factor really shows amazing results in just 2weeks. I love it! My blemishes lighten quite a lot and brighten up my dull skin. It is less oily and love my smooth skin now. Even my pitted acne scar less obvious. Will definitely your product! Hi! I've been consuming AG-Factor for 3-week now . Although I have a fair skin but after taking this product, my skin become more brighter, smooth , firm and my sensitive skin also reduced. Have taken ag factor since early may 2014. Yet to see difference on my face but have realised improvement on itchy dark spot part of my finger which exist for many years. Have ordered for my 2nd and 3rd bottle. In one month of consuming your product Ag-factor, my skin become tighten and glowing.My skin is now smoother. People around me can notice the changes. I just love the product. Hi! I've been consuming Ag-Factor for 2 weeks now. Reason i write in is to contribute my genuine and honest opinion on this product as i myself was in doubt when i first purchase this product. So far so good. Skin looked suppled and with more glow. To all who are in doubt to consume this supplements, do remember that, you cannnot rely on Ag-Factor alone. You need to drink sufficient amount of water and get enough sleep. Lack of sleep makes you fat and not enough of water makes you dehydrates. Hi everyone! in one month of consuming your product Ag-Factor my skin becomes tighten and glowing, It also stops my hair from falling, and now my hair becomes healthy and shiny.Another magical effects of your product Ag-Factor the dark spots on my face become brighter. It also minimizes the pores on my face. 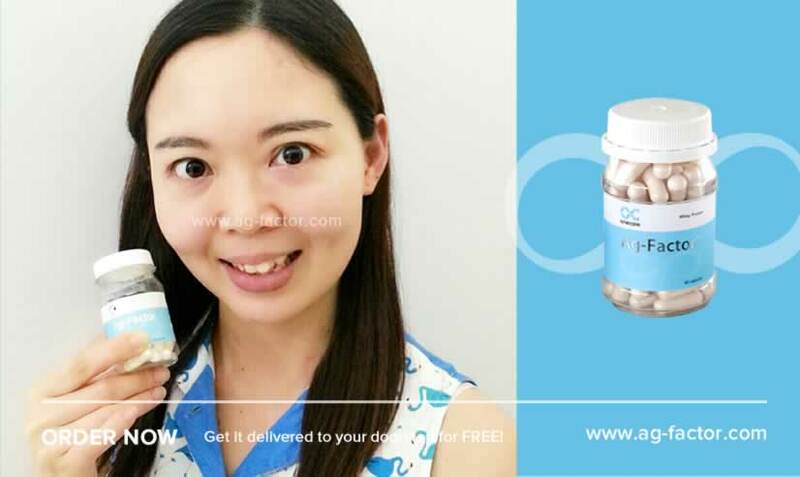 This product can also boost your mind, I've noticed my memory becomes sharpen, because I sleep easily and soundly after taking 2 capsules before bedtime. Now I am waiting for my second bottle. I can say the changes desired occurred in me were totally holistic.... The magical effects most I want were my hair stops from falling! Thank you..! 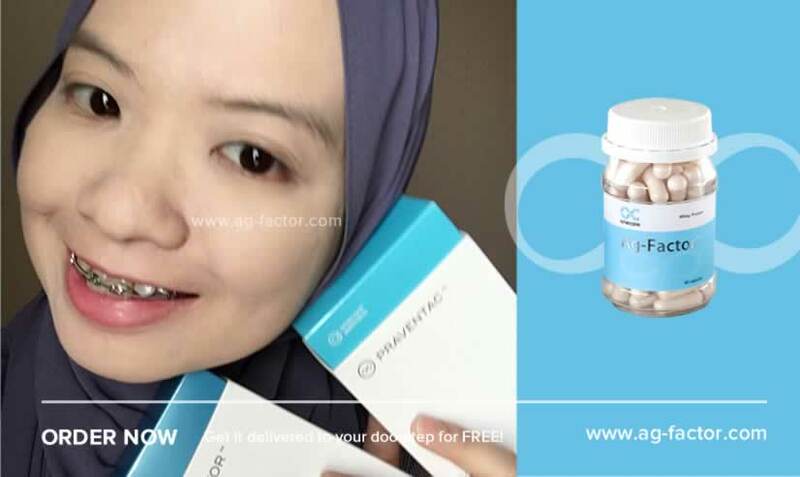 Hi, Im currently taking Ag-factor and Praventac, 2 capsules each before i sleep about 4 month now,and the result is really amazing.My acne become lessen,and i just experienced few breakouts during my mentrual period and it is verry easy to cure.Simply love Praventac and Ag-factor its a best product i'd been try...and i will continue to use this product until my acne scars will disappear...thank you so much PRAVENTAC AND AG-FACTOR. Hello Salamat ag-factor's 2 months lang akong gumamit ang ganda ganda ng skin ko thanks verry much! im using your product for almost 3 weeks. i noticed good effects..I'll order for my second bottle....my question is,,if i will continue this product upto 4 months onwards will my skin would be more fairer!!! hello, im about to finish my 3rd bottle of AgF. the result was amazing i must say. nothing but positive comment for this product. my question is, what happen after my 3rd bottle? shud i stop taking it, wil my skin become dull again? what wud u suggest me to do after the 3rd bottle? AG is an amazing health product. Nature. Science. Technology. Knowledge. It's the best supplements I have, miles better than those "bunches" I had. The best and the #1. 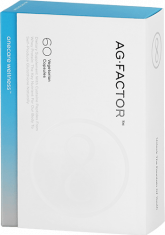 Ag- factor is so inviting, I need to try and place orders, I can't wait to see the effect . Who doesn't want to look young and adorable? The secret is AG-FACTOR! ! ! I have taken Ag Factor and the results were superb. I got a glossy and smoother skin, brihter and fuller. What of this new AG Factor that contains the additional KIWI ingredient? Does it inquire additional charges or the price remains the same. im norma taruc a retir3ed teacher, m 65 yrs. old, but some say that im only in my 50s...whether its true or just a complement...doesnt matter, the truth is that... i just consumed only a bottle of ag factor few mo9nths ago... i will be ordering still. i am from basilan. Hi, I am going to complete my 3rd bottle of Ag-Factor, though it doesn't really clear my pigmentations, but it has really lighten it and my skin is more moist and supple. May I stop for a month and continue on it again? Or can I continue? Tks for reply. Hi! It’s been 5 days since I start taking Ag-factor! I must say that my insomnia is getting better, my pimple marks are less noticeable. I have been emotionally and physically stressed out before I started taking Ag-factor and it shows in my face, now people noticed something has been changed in my appearance, they said that I’m glowing. I didn’t notice my skin color getting fairer since I already have a fair complexion, actually I am closed to being pale, but I noticed that my pale lips are now turning into a lighter shade of pink. How can I be wrong most of the time I spend looking in the mirror. what is like this product is i sleep very much, and i feel much better this product now i believe all of the comments in here. and they services very fast i order yesterday the following day i received already.. thank you so much ag.. keep the good work! My 5th day consuming Ag-Factor....THANK YOU! It's miracle, I hv severe seafood allergy on my face last week. Doctor prescribed steroid. When I stop steroid and started AgF, skin is soft, clear (only 2 tiny pimples came out - wonder why) and fairer than before which is amazing. ( No need to use 'Tabita' ). Can't wait to see the result on the 10th day. een 3 months, after consuming 3 bottles, AG Factor is worth of your budget, results are remarkable, my skin not only fairer but overall creamy white with a radiance of healthy glow, esp if im kissed by sunlight here in the sunnyBahamas and Miami. What i liked more of this health product is that it increases my stamina and endurance, needed for my tough duties on board and my skin is more resilient to stress and fine lines are remarkably diminished. will look forward to buy online. Peptides are in. I have been taking ag factor for the past three weeks. My students remarked that my face looks glowing and I look so much younger. wowwwwww...i just have use it for 3 days...and my skin surface improved so much...ta aq!!!!! Ok...results after my 1st bottle of AG Factor: Less pimple occurrence, and they are smaller in size. The blemishes on my face are still there..but it has become less obvious now. I wonder whether it will clear up? I want to order my 2nd bottle. Do you think I should continue with AG Factor, or switch to Praventac for my 2nd bottle? I cant believe it. Its just been two days since Im taking Ag Factor and during the first night and so on, I had deep sound sleep which Ive missed so much for years. I woke up two days now feel refreshed and rejuvenated due to quality sleeps I had. What would I say further? Well im sure this product will help me a lot when I get back to work again on board a cruise ship soon. I will be on my 3rd contract and with the help of Ag-Factor, sensible food and exercise I would be confident to say that Ag will make a different on my looks as a frontliner in my job. Sleep is always a big issue to me cos I know how important it is, i have insomnia and im always on stress and fatigue. I am just amazed with this product. Even before my 1st order of 3 bottles would consumed up after 3 months, I will reorder again 3 bottles, that time thru a western union money transfer in Maimi. Today, Friday, 29th June 2012, I finally received my 1st Ag- Factor order of 3 bottles. 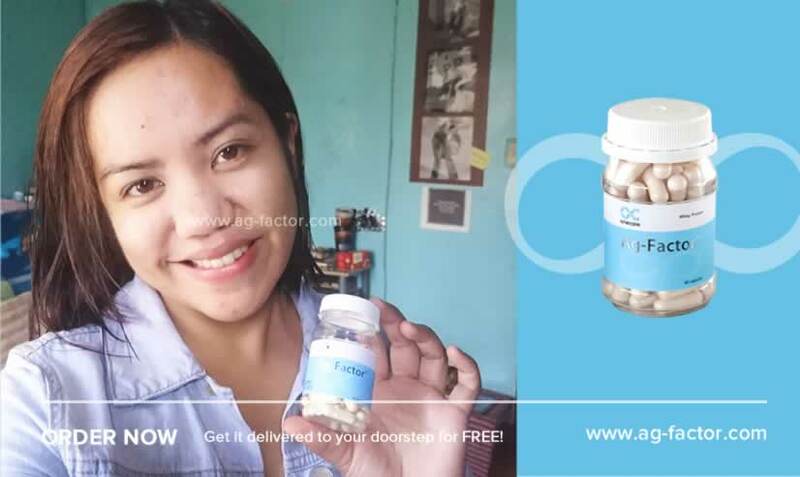 I havent taken and tested it yet, but i am sure and confident that the result will be relevant and truly beneficial for my overall health and appearance. The information of Ag-Factor in its website truly captures my health-conscious personality, as well as my questioning mind over health supplement proliferating in our markets. I have searched and visited several health supplement websites over and over again, only Ag- Factor convinced me to trust it over a hundred percent. I believed and convinced that the secret to staying young is from within and eating a right food and that our body is programmed in nature to decide what it really needs and wants and helping it to enable our body to remember its function through intelligent supplementation. That is Ag by science, research and function. today is my 10th days since i started taking Ag-Factor..Amazing !! my sleeping disorder is completely gone..i could sleep nicely like a baby in the night and wake up in the morning like a new born baby..this is how Ag-Factor works for me in just 10 days..i know i will discover more from Ag-Factor as time goes by...have a nice day everyone !! hi ag factor!! thank u so much for d amazing product..I'm about to finish my 1st bottle n i notice my skin has improved tremendously..unbelievable..but I must say ag factor is definitely pricey thou compared to other anti aging products out there..so I wonder if it is ok to take 1 pill instead of 2 a day? Ag-Factor telah mencerahkan kulit wajah saya pada minggu ke 8.Bukan itu saja,malah rambut saya yg dulu kering kini kelihatan sangat bermaya dan saya tidak perlu menggunakan apa2 cream rambut kerana Ag-Factor bukan sekadar bagus untuk kulit wajah tetapi untuk kulit kepala dan rambut juga. DONE! with my 2nd bottle now! perhaps after 2 mos taking it...my facial skin tone becomes smoother n' radiant. i think for those who're still skeptical with this product it must be a combination of what u balance your food consumption, proper sleeping, taking care of your self esp your skin! uhm for my body i can't see the full effect yet, for my hair it has a fantastic result, my split-ends lessens! You must TRY this capsule for you to know n' feel the OUTCOME! Im already 3rd bottle. Now i see many changes on my skin. Now It's work. Tq OneCaremart. Thanks alot. This is my 7th bottle now good results for me. Today is womens day why Ag don't give promotion like other products having. Ag-factor not only gave me beautification benefits but healthwise as well. I have good sleep now, i also noticed less back pain,and boost my immune system as i don't experience cold nowadays w/c is common to me before..and best of all, i have bright and fair skin now in which my friends already noticed after a month of using it..thank you Ag-factor. Hi Ag! I've been taking praventac and ag-factor for almost 2 months now and the result is great!..... I just wanna know if I can still take kirkland 400IU while taking your product?thanks! Im consuming my third bottle now n im one happy customer of yours.. But i hv one question. What is the diff between AG factor vs sheep placenta capsul..Which one better. Pls explain thanks.. This thing works!!!! I repeat... IT WORKS! I was so sceptical.. Love the results! But when i wake up in the morning some of the red spot are gone and also the dark spot are gone and now in my second day of taking it im so happy to see my body w/o red spot and dark spot already and i notice also that my skin is so smooth than before and i have a good sleep already. .I wake up early today and so excited to share my story. .I really dont have regret to order and spend money and take/use ur product. .And now can't wait to see more result evrytime i wake up in the morning. .In the first day i already notice the result what more in the next day. .Thank you Ag-Factor and Thank God i found you. .This is not a joke or im just making story what for? ?Im sharing this because im happy and satisfied!!! This Ag-Factor is freaking awesome!! It promote my sleep very well. I feel so at peace. It improves my physical health and I feel so lively as before. I can't believe it strengths after trying it out for a month. The redness on my face is decreasing as well. I really am curious to know who is the scientist behind the Ag-Factor. Thanks to ag-factor the redness on my skin was gone and now i have creamy complexion. Thank you to Ms Nancy Panopio, onecare philippine rep she answers all my questions and entertain my inquiries. Thanks for being patient Mam.Till my next order. Actually I have a very fair skin but unfortunately I did not take good care of my skin during my teenage. I am a sport active person and often outgoing without apply any sunblock. I begin to worries when I noticed my skin glow dark spots and started to search solution to diminish it. I have spent alots of money on skin cares and even supplement but doesn't much help. I am so regret and upset for not taking good care of my skin earlier. I really miss and hope to get back my teenage skin. Without giving up I google search on how to lighten off my pigmentation, I found Ag Factor and did research on the product. Finally, I decided to keep a try on taking Ag Factor. Who knows amazing really happen, after finished 1st bottle the dark spots on my skin started to lighten. Of course I continue for 2nd bottles as I have notice the result. Wow, the pigmentation not so much obvious anymore. Now I just start my 3rd bottles for about a week, yeah the dark spots almost fade off. I really love Ag Factor very much as this is the only product which I help me to achieve back my teenage skin. Women at my age typically nestle on the most common problem when it comes to skin. We often refer to them as acne related to hormonal imbalances, sagging and dehydrated skin and ageing. These are atop of my list since I've been experiencing this kind of frustration before. And every time I find a product to satiate my skin, it only leaves a temporary solution and so i am left to wonder what is next. Before , my face was literally a constellation of pimples popping out else where especially during my menstrual period. Not only that but I did experience menstrual cramping which adds up to my stress and so it literally physically manifested in my skin in the form of skin redness, pustules, looking dehydrated and ageing. Ag-Factor after a week of trial has given me proof of its superior capacity to unlock where my skin problems lie and indeed made a change in my skin. The skin redness and acne scars which have deeply blemished my skin gradually started to fade away and further made my skin radiantly beautiful like i was still in my twenties which have been quite noticed by some people. I even felt my skin supple and firm like i can bare it without makeup. Further my menstruation period seemed to be attuned with my skin and body as i don't experience menstrual cramping anymore and only minute pimples are coming out and eventually fade away easily. I am continuously using AG factor because i truly believe on the benefits it can provide for skin. And so i encourage men and women from all walks of life who have had problems as i to try this miraculous product because it enable far more healthy benefits that we can imagine. Wow! After use this 1 month, my skin looks better than before. Proven product and highly recommended. Only i can say with this product is TRUE and really EFFECTIVE. Thanks i found this on my facebook. I tried many whitening and spend thousand even in injectable whitening but i really waste money.. But with this product in 2 weeks, i can see the changing of my skin from dull to a good looking smooth fairer skin. I am now in my 2 bottles, it’s highly recommended..I LOVE YOU Ag-Factor. You’re the best and you’re the answers of my dream to have a beautiful skin. It has been 10 days since i started Ag-Factor and it is really a miracle!! I cannot believe how my dark circles have started to fade and my face is glowing! I am already fair and i have become fairer! I cannot believe that finally i have found a solution to my dark circles after trying countless of expensive methods and procedures (Carboxytherapy, Chemical Peeling, dozens of cream, Dracula blood therapy...) to remove them! Such a problem was really frustrating me. Thank you so much Ag-Factor! I cannot believe that i getting a noticeable result just after 10 days of using the products! I will send you a photo as soon as possible. Thank you for the fast reply. I’ll let you know as soon as possible after i receive my parcel/order. 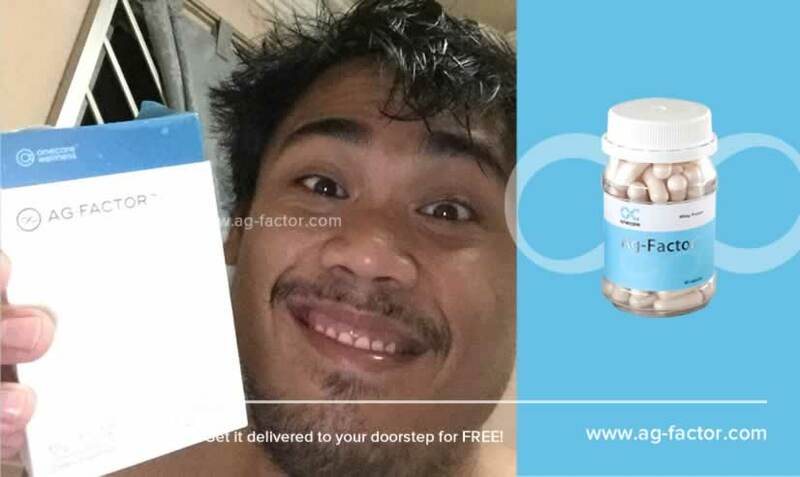 Actually, this is my 2nd time of order 3 months supply of Ag-Factor. I found out Ag-Factor through Google search. 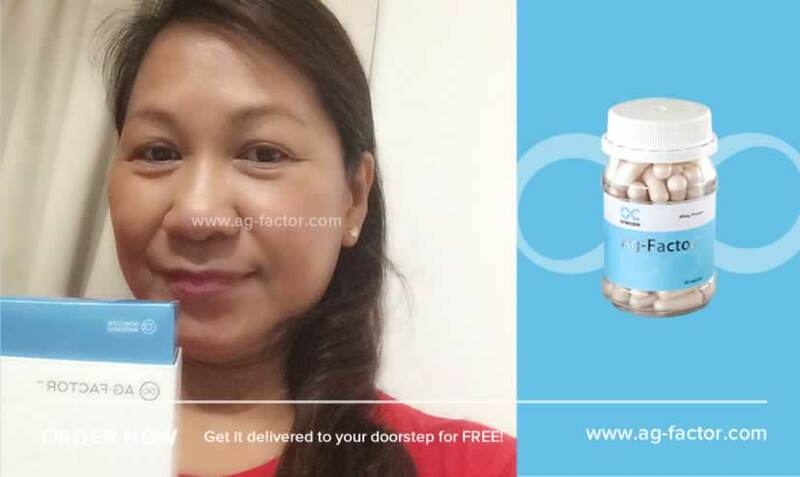 I just opened the 3rd bottle of Ag-Factor from my first order last January 29, 2011 and i’m really happy with the results that’s why i ordered again. Thank you so much! Keep up the good work! More blessing and success to Onecaremart, Onecarewellness, Ag-Factor and Praventac. Till my next order! Hi, i’m currently taking Ag-Factor and Praventac each before sleep about 1 week. The result is so amazing. My acne no come out already and my skin not too oily. I suffered with acne since i was 15 years old until 30 years old. Previously, i spend so much money to buy expensive skincare and medicine. I’m very satisfied with the Ag-Factor and Praventac result. Will update after 8 weeks i used this product. Love this product. This is very very true, Ag-Factor really works in my skin. My friends and relatives always asking me what have i done that my skin got fairer and smoother. In just 1 bottle i got my desired result. This is no joke, i myself is a witness. I have try so many products but Ag-Factor is different, this is the only product that do a wonder on my skin. I’ve been taking Ag-Factor for almost 3 weeks and very happy to see my skin every each coming day. (I took photos of my face everyday - enjoy doing it nowadays..) ;) Every morning I can see it’s getting finer, fairer and more radiant. Radiance, yes that is the word. Really-really heart this product. I am looking forward to see the result after 3 months consumption and what’s more meaningful about it. I am getting married in June, so it’s really a bonus for me. Thanks a lot Ag-Factor. Agree with the others. Is it fine to take it after dinner? I’m into my 4th bottle, thank you very much for Ag-Factor cause my pigmentations really getting lesser and lesser!!! I recommended to my sister-in-law, she was enquiring me of how to get rid of her pigmentations that appears recently so i told her about Ag-Factor and told her to give it a try rather than using products (which i told her not really effective, best to consume) so today i help her order 3 bottles to try, thank you once again!!! Submit Your Product Review Now! Share your thoughts and tell us about your experiences. Testimonial for which Onecare™ product(s)? All submitted testimonial will be subject to approval before we publish it online.